No fire needed. Our s’mores are a great way to cool down on a hot night. 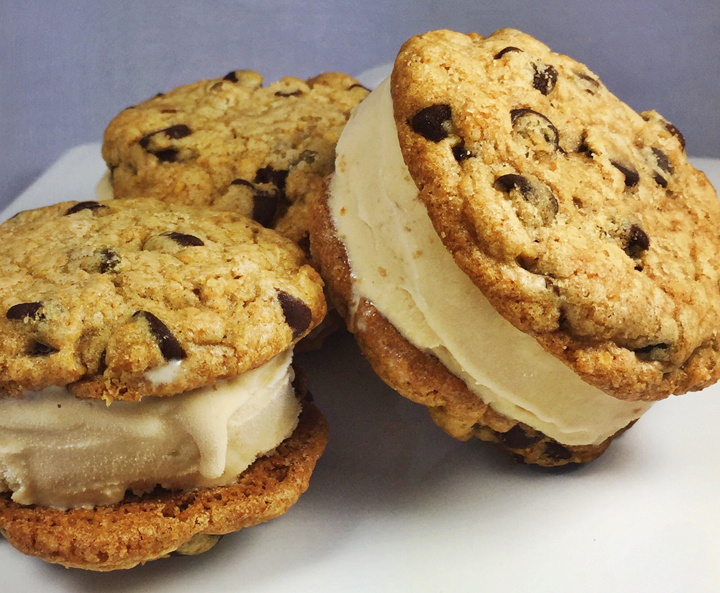 We sandwiched creamy Toasted Marshmallow Ice Cream between two crunchy Chocolate Chip Graham Cracker Cookies. It’s the ultimate summer treat. If you have time, let the cookie dough rest, covered, overnight in the refrigerator and bake the next day. This gives the dough time to develop a more flavorful cookie. Fill a large bowl with ice. Place a medium metal bowl inside the large bowl over the ice. Line a baking sheet with parchment paper and place the marshmallows on the parchment. Preheat the oven broiler to high. Toast the marshmallows in the oven broiler, turning them every 4-5 seconds, until they are browned on all sides. Watch very carefully so the marshmallows don’t burn. Set them aside to slightly cool. Combine the cream, milk, and salt in a saucepan and over medium heat bring to a simmer. While simmering, reduce the heat to low and add the toasted marshmallows; stir until completely melted. Pour the mixture into the metal bowl set over ice and cool the mixture, stirring often. When cooled, strain the mixture through a fine-mesh sieve into a clean bowl, cover, and refrigerate at least 12 hours or up to overnight. Pour the cold mixture into an electric ice cream maker and follow according to the manufacturer’s instructions to freeze the ice cream. Transfer to a container and place in the freezer for at least 4 hours. Preheat the oven to 375 degrees. In a large bowl, combine the flour, graham cracker crumbs, baking soda, and salt; whisk together thoroughly. Using a stand or hand mixer on medium, beat together the butter and sugars until light and fluffy. Add the egg and combine until incorporated. Then add the vanilla and mix again. Reduce the speed to low and slowly add the dry ingredients. Mix until well combined, then stir in the chocolate chips. Make 24 dough balls the size of about 3 tablespoons. Place on parchment lined cookie sheets about 3 inches apart. Press to flatten, bake for 14-16 minutes or until lightly browned and cooked through. Cool on the baking sheet for about 3 minutes then remove to wire racks to cool completely. Place the cookies in the freezer for at least an hour. Set the ice cream out of the freezer to soften for a few minutes. Place a small scoop of ice cream on the bottom of a frozen cookie. Place another cookie on the other side and very gently press together. Place back in the freezer and re-freeze for at least an hour. If not serving immediately, wrap the frozen treats individually in tight plastic wrap. Makes 12 frozen treats.